TUCSON, Ariz. - Arizona's rough roads may lead state lawmakers to do something they have not done in 28 years -- raise your gas tax -- to raise more money for better, safer roads. Most roads are paid for through gas taxes, but the good news of higher gas mileage from modern cars has meant bad news for road repairs. Because cars are using less gas, and they drive more miles, they’re putting even more wear on the roads but bringing in less money from gas taxes. 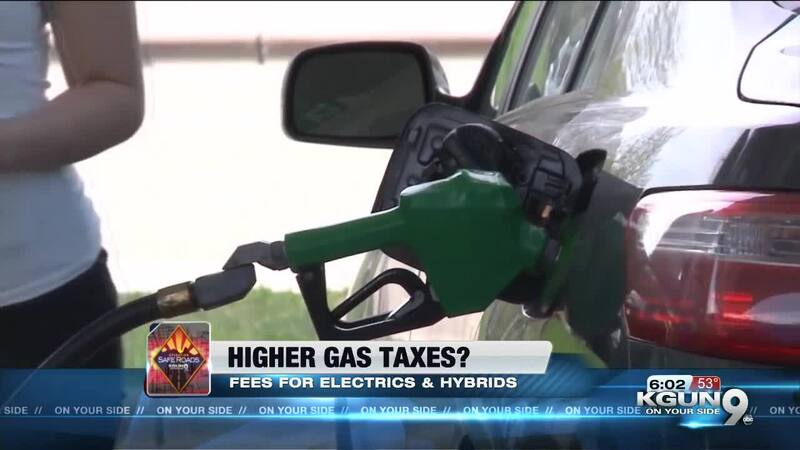 Now Arizona House Bill 2536 proposes large jumps in gas tax, and additional fees for electric cars, which add wear to the roads but generate no gas tax at all. The proposal would change gas taxes from the current 18 cents per gallon to 23 cents in Fiscal Year 2020, 28 cents in FY21, 33 cents in FY22 and 43 cents for FY 23. Owners of all-electric cars would pay $106 in Fiscal Year 2020, $130 in FY21, and $153 in FY22. David Gebert, the president of Tucson's Electric Vehicle Association understands electric cars wear down the roads too but for the sake of clean air and more drivers going electric, he'd like to wait before electrics come under a fee. “I'd like to see it be 5% electric cars or maybe 10% electric cars before we start doing that. Electric car guys don't mind paying for roads either it's just we seem to be paying and paying and not much return." Owners of hybrid vehicles would pay $52 in Fiscal 2020, $70 in FY21 and $80 in FY22. Vehicles that use diesel, propane or natural gas would pay increased fees based on fuel type and whether they are for personal or commercial use. Buck Crouch drives a big truck with bad mileage but he sees the need for more gas tax. "Because our roads are in really bad shape. The vehicles are what tears them up . And the heavier the vehicles the more road damage." The tax proposal has passed the House Transportation committee but has to clear tax-averse members of the full house and Senate before it hits the Governor's desk. At A and M Shell on Speedway, Dorothy Morrison says if the tax passes there's no choice but to pay but maybe that'll help avoid paying for what bad roads can do. "We've hit potholes and had a bill because it broke something under the hood. It makes sense. If we don't maintain our roads what good are our cars? Pima County has been so eager for more road repair money that it’s been considering using a share of property tax for road work . The County supports the proposal for higher fuel tax.